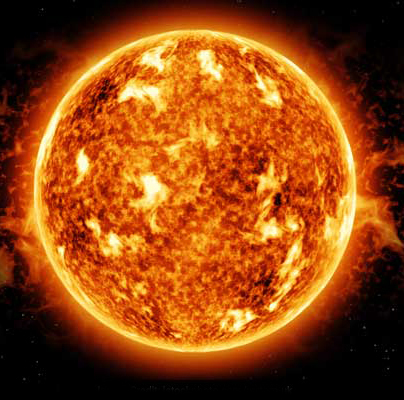 What is the purpose of the Sun? We are benefiting from the Sun in quite a few ways. Being at just the right distance from us, it is the source of energy for our planet, providing just the right amount of energy to power life, without burning us up, but preventing us from freezing. Every day, the Sun sends us more energy than all energy producing mechanisms created by humans, combined. This energy is not only good for making us warm. Through the process of photosynthesis, the Sun powers plants to recycle carbon dioxide we breath out into much needed oxygen we breathe in. Without the Sun, not only would we freeze, but we would not be able to breathe. The Sun also powers weather on our planet. The rain and wind triggered by our Sun, is necessary to grow plants on our planet. Without the Sun, we would not have anything to keep us warm, to breathe, or to eat. The Sun was also created to keep track of time. We get our notion of a day from the way our planet is set up to orbit the Sun. Realizing how much their lives depended on the Sun, ancient people worshiped it as a god. But there's no need to do that. The Sun is just a servant of God, put at just the right distance from our planet by our Creator on day 4, to make this place habitable for people created on day 6.